As architects one of the most significant contributions we can make to support local and global sustainability is to design buildings that are energy efficient and use renewable energy – such as solar energy. Since the 1970’s many of our projects have been using 40-60% less energy than normal code-compliant buildings and often not costing any more to build. Our approach to energy-efficient design is based on extensive knowledge of daylighting and passive-solar heating principles, and cooling-load reduction strategies. Since 1977, we have designed over 100 energy-efficient, daylighted buildings which were built within normal building budgets, and have been recognized by state and national awards. Whether you are interested in formal LEED certification or just in taking advantage of energy-efficient, sustainable practices, our architects and engineers are ready to support you. Skylights illuminate interior spaces and the ceiling lights are automatically dimmed or turned off to save energy. Skylights and windows illuminate perimeter spaces. Note the lights are off and bright sunlight is diffused with rollershades. Energy efficiency and sustainable design were top priorities for Chesterfield County. Therefore, the North Courthouse Road Library incorporates a wide range of sustainable building strategies which reduce the consumption of non-renewable resources, reduce negative impacts on the environment, reduce the consumption of non-renewable energy and support the health and comfort of building occupants. The United States Green Building Council's LEED-NC 2.2 Green Building Rating System was used as a guideline to inform the sustainable design process. The library was designed to achieve LEED Silver Certification. The selected Virginia sourced and manufactured red brick creates the traditional architectural style that the Owner favored and helped the project achieve LEED Silver Certification by earning LEED credits for Regional Materials. Preserving and improving the site was a high priority.This 11.5 acre site was previously about 50% farm land and 50% forest with a stream an agricultural pond and some wetlands.Almost all of the existing trees were saved.The existing stream and wetlands were undisturbed and the pond cleaned out and improved. LEED Certified Silver by the United States Green Building Council the North Courthouse Road Library is designed to save 25% annually in energy compared to a baseline code-compliant building. Natural daylighting provided by windows and high-tech skylights make a major contribution to these energy savings and also create a light filled interior that is properly controlled for reading both print and screen information. Many other sustainable features are included. See our Sustainable Design Case Study for more: PROJECT SUSTAINABILITY PRESNETATION. Virginia Beach’s flagship Central Library was designed to anticipate the then emerging trends of information technology, sustainable design and the re-imagination of what a library can be. The library’s unique roof line allows ribbons of glass to direct natural daylight into almost every room saving energy and providing a serene environment. Many other cutting edge strategies were identified and included. Computer models predicted 40% energy savings. And the project came in under budget! 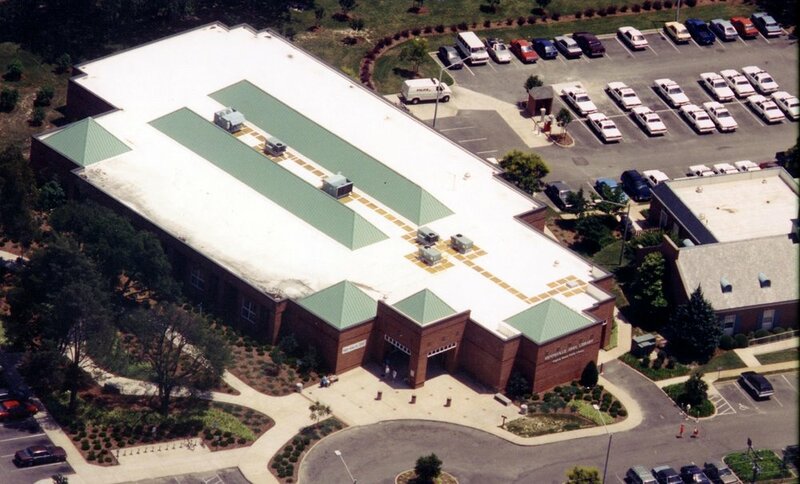 Awards include: Best New Building Award by Portfolio Magazine, 1988; Award of Honor for Architecture by the Virginia Beach Arts and Humanities Commission, 1988; and Energy Design Award by the Virginia Society of the American Institute of Architects (VSAIA), 1987. In 2012 the VSAIA selected the Central Library for their prestigious Test of Time Award which recognizes buildings at least 25 years old that express enduring architectural significance. This small office building is designed for natural day-lighting with windows and clerestory windows above the roof. The articulated front wall is calculated to provide direct sunlight during the winter heating season when the sun is low in the sky. 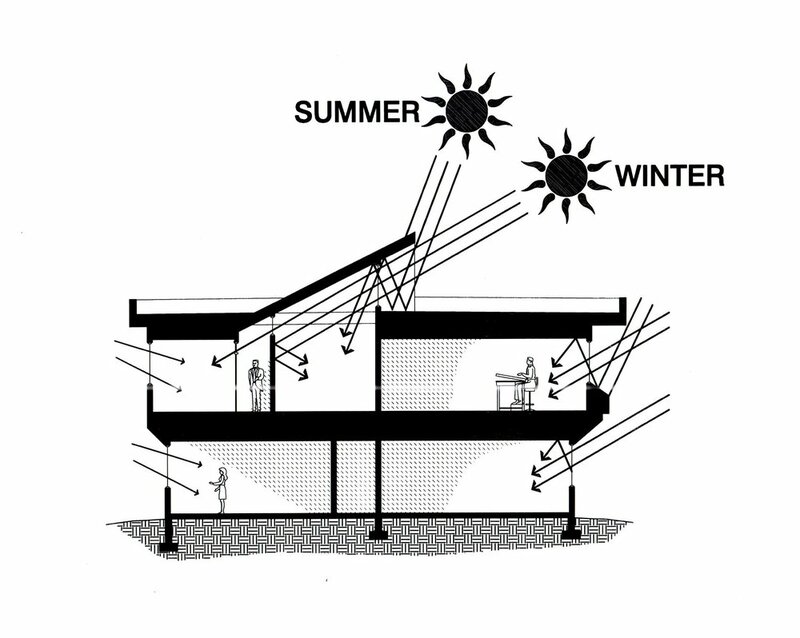 During the summer the high sun is blocked to reduce air-conditioning energy costs. Natural day-lighting was provided by roof top clerestory windows, south facing windows and north facing windows. The electric lights were automatically dimmed or turned it of in response to the amount of daylight inside the library. The energy efficiency of this simple design was very impressive and the construction cost very low. The public and the Librarians loved the natural light.